Finally, something I don't have to filter! It is A PRESENT FOR DANI!! First underwater comedian ever! He even switched his hat for a band of kelp. I know it ain't perfect...so just think of it as a test run for your future birthday present. Thank you, Dani, for being such a good friend. I don't deserve your kindness, but I certainly do appreciate it, especially at this point in my life. And...heh...I promise I'll finish your story soon too. Eeep. 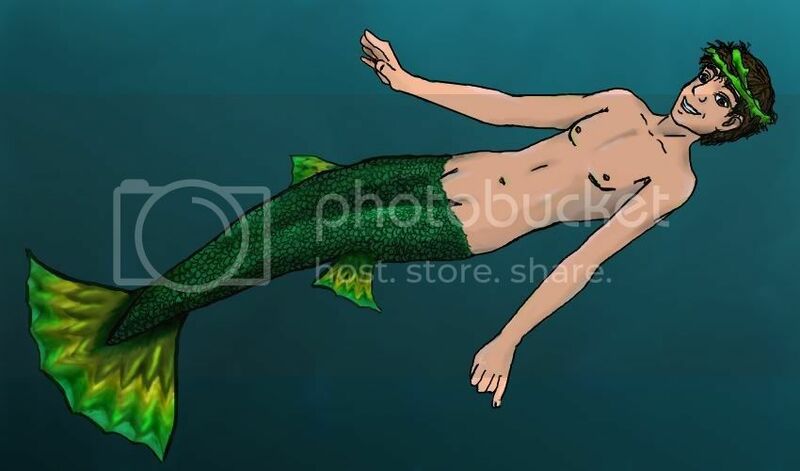 Jeremy is a pretty Mermaid!!!!!!!!! ROXIE you are so TALENTed! talent WHORE! i want your babies! is this what happens to you if you swim as much as Jer do? Roxie you are amazing and I love you, I wish I had seen this post when you first put it up, but my internet is the whore of the Moor of Venice. SQUUUUUUUUUUUEEEEEEEEEEEEEE for my crazy requests for mermen being forfilled, I am so glad I at least saw this picture around when you posted it! I love the tail so much it looks like it is floating and rippling and becoming one with the water! You are the bestest, and it is truly I that do not deserve you. Thank you so much for the early b-day present!